Donkeylicious: Instead Of Drilling, Should We Build India Subways? Instead Of Drilling, Should We Build India Subways? 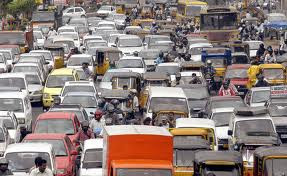 I'm reading Brad Plumer's post about how the billionth automobile just hit the road somewhere in the world, and wondering if building subways for up-and-coming developing-world countries be a good way to solve energy problems. Oil is a global commodity. If you find some anywhere in the world, the added supply reduces global oil prices, not just prices in one specific location (setting aside issues related to transportation costs). I don't see why there's any difference, as far as long-term energy security is concerned, between discovering a whole bunch of new oil in the Indian Ocean, and reducing Indian oil demand. As the term suggests, a lot of developing countries right now are developing their urban infrastructure. It looks like a lot of them could be at a tipping point where they decide to either build up the dense urban way, where people live really close together and go places on trains, or the dispersed car way, where people live far apart and consume energy by driving long distances. Tipping them the dense urban way would be a good thing for our ability to satisfy future energy requirements, not to mention the threat of climate change.